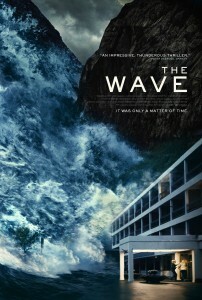 The Norwegian disaster film The Wave depicts what could happen if a landslide induced tsunami were to hit the small town of Geiranger, an event that scientists claim is imminent and that has indeed happened to other small villages in the past. We are introduced to Kristian, his wife Idun and their two children. Kristian is a geologist working with a group monitoring the local seismic activity as well as the integrity of the mountain pass of Åkneset, which is becoming unstable. Unfortunately Kristian is the only one who picks up on potential warning signs and the townspeople are only warned when the actual landslide happens, giving them all approximately 10 minutes to get out of town to higher ground before the tsunami hits. The Wave is an extremely impressive film with a solid story that is rooted in fact as these landslide disasters have happened in Norway and are predicted to happen again. A fabulous cast conveys The Wave’s story, all of which turn in strong performances while director Roar Uthaug crafts a great sense of suspense and unease, which is all backed with amazing special effects once the disaster gets underway. It seems obvious why Roar Uthaug has been tapped for the Tomb Raider reboot and Norway submitted The Wave as their official entry for foreign language film to the Academy Awards considering that The Wave can compete with most Hollywood disaster films and was produced for a fraction of their budget. The Wave will certainly entertain any fan of the disaster film subgenre and is truly an entertaining and tense experience.